One morning, I woke up long before the sun was rising. I walked into the bathroom, closed the door and flipped the light switch. Nothing happened. Then I realized there were no lights anywhere. The programmed lights outside weren’t on. The little light on the electric toothbrush wasn’t flashing. Hmmmm….no instant gratification light going on here this morning. My typical routine is: get up, brush my teeth, walk into the kitchen and “put the teapot on” then, after I’ve poured my tea and depending on the day, get ready to see a client, start writing, throw a load of laundry in the washer, or read something good for my soul. It was only 42° outside and, since the power had been off for a while, it was a bit chilly in the house. I went to my desk, found my phone and turned its flashlight on. I sat down in the library (with a blanket around my shoulders) and started writing in my notebook, by the light of my phone. It was around 5:00 by then—still at least an hour until sunrise. I became aware that I’d need to leave for my first client appointment by 8:15, and that chances were pretty good that there was not going to be a hot shower this morning. Then, I thought about my time in Honduras nine years ago. In LaEntrada we were fortunate to have any water for a shower and hot water was a real bonus! I remember coming home from that mission trip changed and aware of my ignorance—believing I should be able to just flip a switch, or turn on a faucet, and expect something to happen. 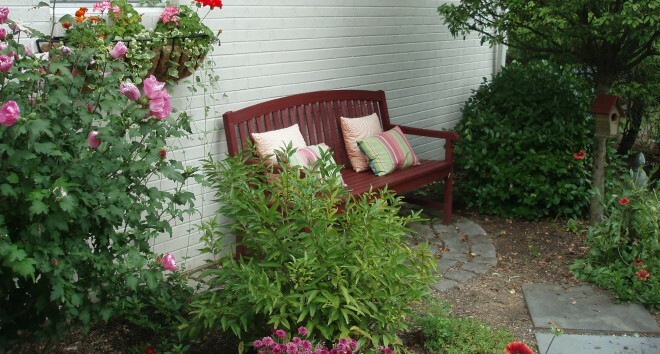 As I was sitting there, it seemed to get colder and I wrapped the blanket more tightly around me. Then, I thought about all those who are cold every single day. My pen ran out of ink, so I had to get up from my comfortable spot and fumble around to find another one. I thought about the hot cup of tea that, because of no electricity, I wasn’t drinking. Then, I thought about all those who don’t even have clean water to make a cup of tea, or enough food to eat or any food to eat. The shivering turned to calm and, as my thoughts turned to words gliding across a page, I realized there was a giant shadow of my hand and pen on the ceiling. That made me think of all the shadow puppet games I played with my daughters, now grown women. Then I thought about the decades that have flown by and how much I have in my life. I turned the flashlight off for a few minutes. There were no little blue or red lights flashing on my desk; no signs of the electronics that we hand over so much of our time to. There were no humming noises from appliances or heaters or lights. I paid attention to the howl of the wind outside the windows, and the drops of rain pinging off the glass. I could hear it so clearly in the absolute silence of all else. There was only, and simply, the dark and the sounds of nature. In the dark everything became clearer. As the sun came up I watched the raindrops dance on the slate walkway outside the window where I sat with a blanket and a cell phone flashlight and a notebook and a pen, and I wrote some more. I thought about God and my daughters and my grandchildren. I thought about my husband and my friends. I thought about grace and hope and joy mixed with pain and sorrow and despair. I thought about love and loss. I thought about how small we are, and how great we are. We walk through life flipping switches all the time without awareness of what we’re doing—actions that are simply part of the way we move through life. We forget to appreciate anything because we expect everything. We assume there’s going to be heat and hot water and lights that jump to attention. We open a refrigerator door taking for granted that we’ll find food that’s cold and fresh. We flip on our electronics presuming that we’ll have instant access and are upset when our instant gratification is delayed. And, we “flip on and off” experiences, conversations, and relationships like we do a light switch. We’re on autopilot so much that we don’t even realize how much we take for granted and we don’t see what we’re missing. 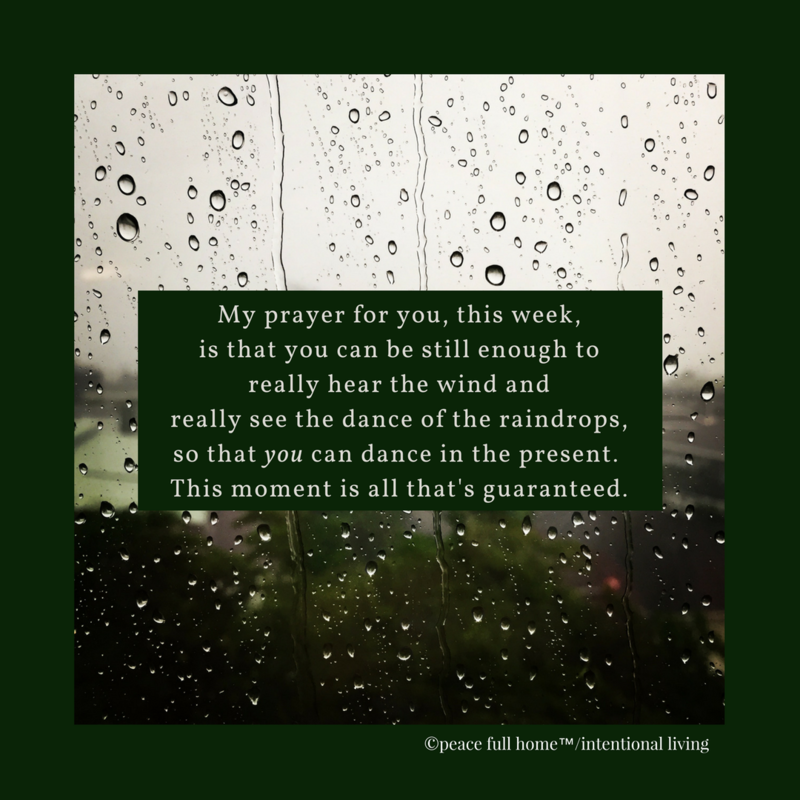 So, my prayer for you this week is that you can be still enough to really hear the wind, and really see the dance of the raindrops, so that you can dance in the present. After all, this moment (in the light or in the dark) is all that’s guaranteed. This entry was posted in God In Our Lives, Peace, Peace Full Home and tagged dark, God In Our Lives, Grace, grandchildren, Honduras, hope, instant gratification, joy, light, light in the dark, loss, Love, power, prayer, rain, truth. Bookmark the permalink.